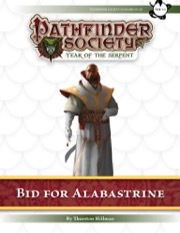 Alabastrine is a pure roleplaying and skill-based scenario. And it was a great experience. It was extremely similar to The Blakros Matrimony, in terms of setup and mechanics. You need a good roleplaying GM to make this shine because this scenario could easily vary from a 1 star experience to 5. Some reviews have said that this scenario is more easily accomplished through Knowledge skills and that simply is not true (my character had only diplomacy and sense motive and did well). You can relate to almost every patron through Diplomacy, it’s just more difficult. By allowing skills other than diplomacy to be used on certain bidders, IT’S ALLOWING THE ENTIRE PARTY TO PARTICIPATE equally. The history and city of Alabastrine also evoked the imagination. I wish the bidding was done in the city. The environments also made for good roleplaying moments. 1) I had 4 creative solutions and they were all ignored. Of course, you don’t want to break the scenario, but it would be nice if they had some effect. Maybe it was more of a flaw with the GM. 2) The NPCs didn’t have as much personality as The Blakros Matrimony. Most of the roleplaying “flare” came from the party environments rather than the personalities of the patrons. 3) Editing errors. The two hammers touching on the bridge was mentioned far too many times in the box text and became a running joke at the table. 4) I believe my GM adjusted the DCs of the skill checks down, that they were too high. Experience: Player at subtier 1-2 with 6 average PCs. Overall: A great roleplaying scenario, I hope to see more that are similar to this. (9/10). I played this scenario on high-tier with a party of four during a convention. The other players brought a level 2 alchemist, a level 4 inquisitor and a level 5 fighter to the table. I myself played my level 4 gnome mesmerist (fey trickster archetype). Long story short, we had a great time. The scenario gives stopping an evil organization from taking over a city a new spin. Instead of an evil plot, this time it’s politics and urban development. In real life I work in the field of urban and regional planning, so this instantly became a fun scenario. I’m a bit biased, but that won’t stop me from writing this review. Before I continue, I should point out that I don’t have a lot to say about the combat in this scenario. Our crowd control just made it a cakewalk. The main part of this scenario is a social sandbox. In order to achieve your goal, you have to influence various NPC’s. How you do that, depends on your approach. Your success, in this case, isn’t just a single dice-roll either: there are several things that can influence the outcome. Certain strategies are better than others, and some things only work against you. It’s an interesting mechanic that has been used before, but still continues to perfectly fit a PFS scenario. What’s best is that everyone can participate no matter their class, and ‘unique’ skills get rewarded. In our case we had our alchemist successfully identify weaknesses and strengths, as she was the only one with a certain knowledge skill. She also helped influence a character the others couldn’t. The fighter, even though he had few skill points, played his part by assisting and using sense motive. The inquisitor did what he did best: intimidate people into submission with a whopping 46 on a single check, while my gnome mesmerist ended up using ‘profession: interplanar real estate agent’ to its fullest potential. Yes, I got 4 ranks in that profession. People laughed at me for even doing that, but this is the second scenario where that profession ended up being useful. Ignoring the combat, the social portion of the game was outstanding. Everyone could contribute in their own unique way. The events during that section were all different and allowed different characters to shine. We all had a great time and I’m looking forward to running this myself. Apparently it’s a lot for a GM to keep track of, but I hardly noticed it. The only thing I did notice is that the plethora of handouts she gave us, helped a lot. This is one of the best scenarios of this particular season and I can’t recommend it enough if you like to roleplay. When I played this, I feared I would be more of a cheerleader, then actively contributed a lot. But my cavalier was super helpfull! With just Diplomacy and Know. Religion, I could help out a lot. We had a good amount of roleplay. It is however a complicated scenario, and you must not doze off at the table. This is true for Players as for the GM. It will need a good prep time too, so 4 stars for me, as it requires a lot from the GM. Had a good lot of fun. The Influence system in this is terrible. Giving extra handouts with the rules simplified and stipulated, reinforcing them verbally each time, and giving out a flowchart still wasn't enough to make it flow well enough to not inhibit the roleplaying. The fight is well set up, but the NPCs are terribly built. Even making a separate print of each Bidder to use for a GM reference to organize it well enough to keep from there being pauses while I tried to look up tiny details. If a GM had time to memorize this thing, that might make it better, but I certainly don't have that kind of time. I didn't enjoy playing this scenario, I didn't enjoy GMing it, and none of the players at either table enjoyed it. I get that the idea is to get rid of one diplomacy role being the single judgement of an interaction with others, but this is not the way. Reading through and playing this scenario reveal a couple of contradictions within. The prose descriptions of things and the combat felt hastily scraped together to me. The combat is a joke. Not a funny one, but a joke none the less. A single combat encounter scenario (which despite being written as 2 combats this is) should be difficult (and to me I'd prefer it at the end). An APL -1 or APL encounter just doesn't cut it. If you have a combat, have a combat, if you don't (and there are great scenarios without combat) then don't, but the super-generic speed bump doesn't cut it. The NPC development/backstory is actually quite good. The prose/descriptions are ok, but highly repetitive and often feel like copy/paste or basic thesaurus changes. There is something Dickensian about the descriptions (but not really in a good way) as it felt like the author was trying to puff up his word count by using repetition. The Intrigue mechanic is pretty good, but for a social scenario (as it seems to be) it doesn't really use social mechanics much, and if your party doesn't have some of the 5 needed skills you're gonna have a bad time. The social interactions at a certain point just felt too much. Had there been more characters to interact with, or some more flip-flopping or something built in it would have complicated an already complex situation but wouldn't have felt quite so blase by the end. Overall, I think the author had some shining moments and made use of a nice mechanic, but I felt that those moments were more hidden from the players and GM dependent while the not-so-great was more obvious. Please tell me Temel Passad makes an appearance. For reason I cannot fully explain, my players have spent the last 2 years believing him to be an enemy of the society, and at the end of Season 5 even tried pulling the face of one of their real enemies off believing it was Passad in a rubber mask... Which makes him one of my favorite "Villains" to use even if he isn't a villain. I not only LOVE that this takes place in Druma, but that John and Linda got THURSTY to write it! That's SO funny! Is there something special about Druma Lodge? ._. It was a rallying cry that arose from my first rendition of #6-98: Serpents Rise, based on the [not necessarily true] supposition that there is no Pathfinder Lodge in Druma, and therefore pretending to be from the Druma Lodge would mean that nobody would be able to call the PCs' bluff. There's a lot more to it than that, but going into it involves a lot of spoilers. I remember watching the tail end of that table while we were relocating my Serpents Rise group to the Syrinscape table at PaizoCon last year. Let's see, I remember Thursty and Liz both on there... The Pratts... I think Jessica was as well, but I *was* rather juggling my players' needs at the time as well. I am a little surprised it's a tier 1-5, though... perhaps better stated that "I am concerned about the team that'll be going on this venture, Captain...."
I think it'll make a lot more sense then, and I hope you get a chance to play it soon! Once it's been out for a while longer, I might write up a blog about the experience along the lines of "Let me tell you about a time my game went completely sideways." How does one pronounce "Myrosype"? Thanks John! Running this one at PaizoCon UK, looking forward to reading it! Can you clarify which district is which color? He ... hands the PCs a map of Alabastrine. He points to each of the map’s districts and relays the information on each of them presented in the Alabastrine, City of Heathens section on the right. That side panel doesn't exist on that page in the scenario. The larger section doesn't say which section is which color. Some are self explanatory but confirmation would be awesome. My hype for the general release of this scenario intensifies. Can we get a list of Flip-Mats and/or Map Packs that it uses? That is the evilest thing I could imagine. I very much disliked this adventure. 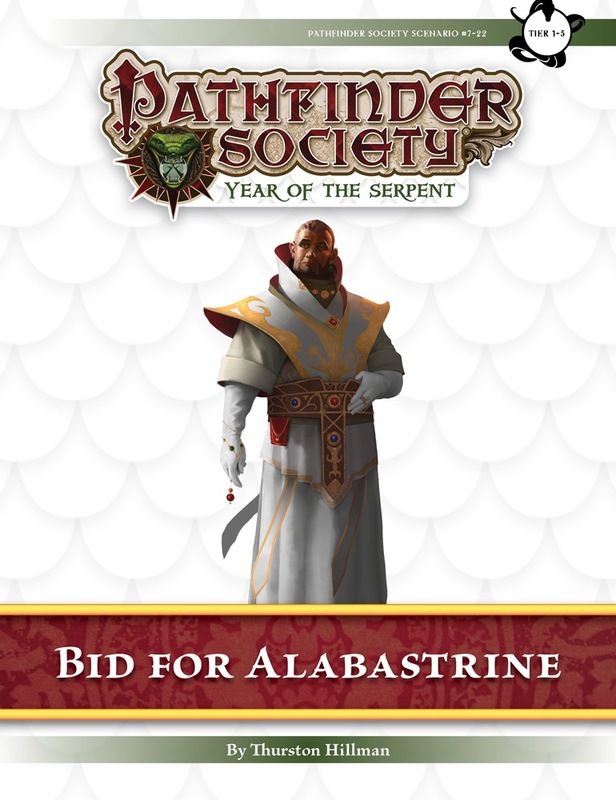 Pathfinder Society is a pick-up game- you never know what your players will enjoy. This is not a problem when there are things for everyone (combat, puzzle, social interaction). Everybody get what they like and enjoy as other claim the spotlight temporarily. This adventure was almost all one mode. After a short fight at the start it became all about social and knowledge rolls. While interesting in itself, it contained almost nothing that I come to play Society games for. Frankly, I like the fights, I only make combat oriented characters, and am not interested in other types. This was fine... until this one. The writer could have put some combat in... perhaps between events as a rival tries to stop us from completing our goal, such as assassins at night. This could have also been a good for the right players, just not me. Anyway, after three hours of this and two more rounds of bids/influence to come, I left the game. I ran the scenario and really enjoyed it. It was my first experience with the Influence rules and I was concerned about timing, going too fast or too slow. As it happened paying attention to time and giving each player a chance to describe their actions at each phase as well as a bit of RPing for those who wanted to, worked out just about perfect. Anyway in short it was a good time. I have played several adventures without a single combat and enjoyed them, but not this one, even though it had one big combat in the beginning, mostly just to say, "Hey, we had a combat." As it was in no way relevant to the plot of the story. One of the reason I did enjoy the others was that combat was an option we could have taken, but we choose a different route. There was no different route to choose here. My not-all-that-skilled character rolled poorly on those skills she was good at and the DCs were too high for her to succeed with her good rolls on the skills she wasn't that good with. I really enjoyed the scenario, but have some caveats. 1) I'd already heard rumor that it was 90+% non-combat and encouraged to NOT play a martial character. 2) I chose a skill monkey character, and more importantly a character that I enjoy roleplaying with one of my more well developed personalities. 4) I guess that may have been because it was designed for as few as 3 or so of the players actively participating in the skill checks, and thus when all 6 players participated it bogged down a bit. I found this a delight to run and my players seemed to really enjoy it; it took a fair bit of time for the first couple of events but by the 4th or fifth everyone was comfortable enough that they were already planning their actions ahead and ready with their choices when it was there turn. they had the meeting in Myrosope's office I loved, LOVED the looks on their faces when they heard what she had to say. They really gave it some considerable thought. Thanks, Thursty...this was really awesome. 1. The combat at the start felt like it was included for the sake of having a combat; it made no contribution to the plot at all. 2. Overly heavy use of the same 3 skills. I like that there were alternative skills that could be applied in most situations, but there was nothing those 3 were useless for. Nice review! Consider leaving the same post in the review section as well to increase visibility for others planning on running it. AS long as you get the EPIC map and not some squiggles that seem to indicate something that might be something maybe on a map that's much like any other hand-drawn map you've ever seen. No offense to the GM, the areas were clearly delineated and aligned, it just lacked a certain... feel? I like the story, however, there are many things I think that need to be worked on for this scenario. My comments are based on playing it, and not GMing it or reading it. First of all, organization of the social mechanic needs to be clearly organized. Many GMs reorganize it on their own--which is additional work on their part, which make it a bit better. Writing the rules is different than teaching it, explaining it, or playing it. One should look at the top board games and see how they organize their sequence of play. Chase mechanics have this problem as well. While I agree that these mechanics ATTEMPT to make characters more diverse, I think it makes playing more difficult and more frustrating...which overall is bad for the game (email me if you want to debate this, because I'm sure there is a lot of incorrect rationalizations). Second, the ways to influence the participants are quite limited. Most of them skills are trained only, and may not be ones that people have as a class skill. Some of the skills are secondary tier skill such as knowledge nobility, history, or engineering. These are secondary things like spellcraft, knowledge arcana, or knowledge local. In previous scenarios that were similar, one could always use a charisma check. This was not offered, and based on the GM, it was either absent or difficult to find in the scenario. All of the bidders can be influenced with Cha-based checks. No promises about how much harder those skills will be, however. There are two scenarios that I despise. One is the Bid for Alabastrine and the other is the Blackrose Matrimony. I have played the Blackrose Matrimony and the table I was with despised it. I have run the Bid for Alabastrine and the table despised it. Amazing that both were written by the same person. Not going to give away too much but the social aspect of both just seemed to drone on forever and ever. The combat encounter in one was trivial and the combat encounter in the other for low tier was a tpk if the party had not run away. Played this one with a group of 5, relatively under leveled, but just pushed into high tier. The party had the majority of skills needed, but just decent bonuses on the rolls. Going around the table and watching roll after roll of single digit numbers, compounded by being locked out of the skills we were good at to bad rolls, led to a pretty poor play experience. The GM was awesome, so he was able to bring the characters to life at least, but I don't think anyone at the table enjoyed outright failing a scenario by repeatedly failing skill checks. Maybe there are some sort of tactics to employ in the intrigue system to push things in your favor, but I didn't see them. It didn't really seem like there were many choices to be made. This scenario made my "never going to play again" list. Not everyone likes the things that I like, and that's ok. Without wanting to sound like I'm being a jerk, because I'm really not snarking here, I'm going to take the negative comparisons to Blackros Matrimony as a suggestion that I should play or run that.